CERN will be sending a neutralino into orbit. But how do you get a theoretical, as yet undiscovered particle into space? Well the answer is easy – ask an astronaut to take it with him! 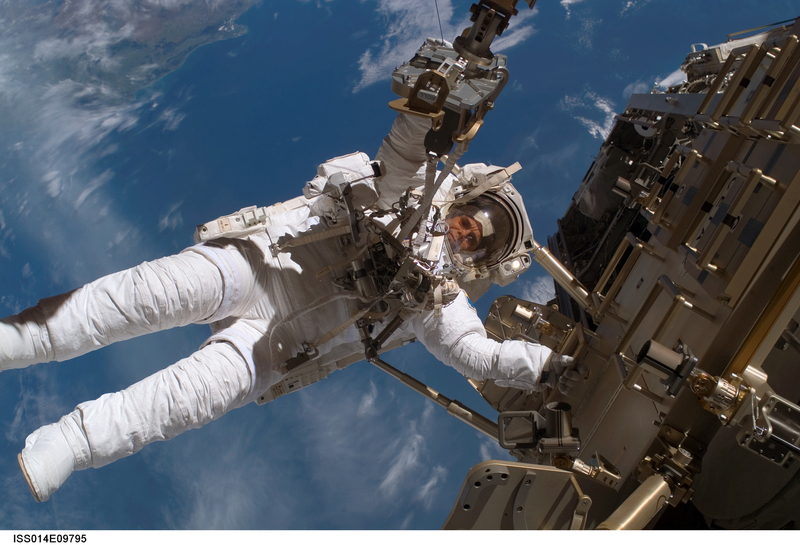 European Space Agency (ESA) astronaut Christer Fuglesang, STS-116 mission specialist, participates in the mission’s second extravehicular activity (EVA) as construction resumes on the International Space Station. Image: NASA. The plush particle with the CERN logo hand-made by Julie Peasley (http://www.particlezoo.net/) and taken into space by Christer Fuglesang. It’s true that many people come to CERN and never leave. But those who do escape CERN’s gravitational pull often go on to a whole variety of jobs all over the world. To find out more about ‘life after CERN’, the Bulletin is starting a new series of interviews with CERN alumni. This issue we kick off with a very high-flying former CERN physicist – Christer Fuglesang. He is scheduled to fly on the STS-128 NASA mission onboard the Discovery space shuttle. No, as you might have guessed, this is not a real neutralino, but a soft toy version created by Julie Peasley, the particle zookeeper. It will be taken to the International Space Station (ISS) for a 13-day flight by Christer Fuglesang, a former CERN physicist-turned-astronaut. Fuglesang started at CERN in 1984 on the UA5 experiment. He later worked on the CPLEAR experiment and ATLAS before being selected for the European Space Agency astronaut corps in 1992. As a memento of his time here, Fuglesang wanted to take something representing CERN up into space on his next mission. 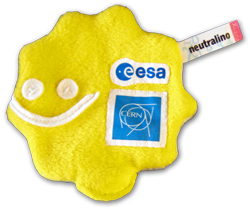 But rather than a CERN baseball cap or t-shirt, he will take a specially made neutralino, branded with both the CERN and ESA logos. The neutralino was chosen because it links together astrophysics and particle physics. Fuglesang’s next mission to the ISS, is scheduled for launch in late August. This is Fuglesang’s second space flight. Originally from Stockholm, he has the honour of being the first Swedish national in space, with his first flight in 2006. The Bulletin managed to get a few moments out of Fuglesang’s busy training schedule to find out more about his life as a particle physicist and an astronaut. Why did you want to take something from CERN into space? I’ve always felt close to CERN and still love particle physics, although I don’t get to work much on it anymore. I also think there is a nice connection between ESA and CERN, two successful European scientific organisations, both of which I have been lucky enough to work for. I loved my years at CERN, it was a very stimulating environment, with scientifically minded people all around you, always ready for interesting discussions. Did your experience at CERN improve your chances to be selected at ESA? Astronauts come from many different areas: military pilots, engineers, medical doctors, and researchers in various fields of natural sciences, including physics. I believe my CERN experience gave me an edge because I worked in large collaborations, it is very international, I worked both hands-on with experiment hardware and computer software. What are the best and worst things about being an astronaut? The best is the variety in things you get to do: fly airplanes, work under water in the pool, simulations in space craft simulators and you get to do a lot of physical training. Best of all, of course, is the space flight itself, which is a wonderful adventure on top of exiting work. The worst thing is that you have little influence on your situation and what you do. You do what you’re told. There is not much creativity in the job. Does your experience in experimental particle physics help being an astronaut? Not specifically. But in general terms: experiments at CERN are large and technically complex with many people involved, which is also the case with space vehicles. I have used my experience in particle physics to work with radiation caused by cosmic rays affecting astronauts in space, which is a direct "heritage" of my work at CERN. But in fact, this is not something astronauts generally do. What is your next mission? What will come after that? I will fly on the mission STS-128, planned for 25 August. It’s a 13-day flight with the space shuttle Discovery to the International Space Station (ISS). We are bringing logistics to the ISS: food, clothing and other things to keep the permanent crew of six alive and well. We are also bringing new experiments onboard, and spare parts. Among other things we will exchange a large ammonia tank for cooling on the outside of ISS. That job will take almost two full space walks. After STS-128 I don’t expect to fly more missions. Not that I wouldn’t like to, but there are other European astronauts in line waiting and ESA have too few flight opportunities. More information about the STS-128 mission is available.